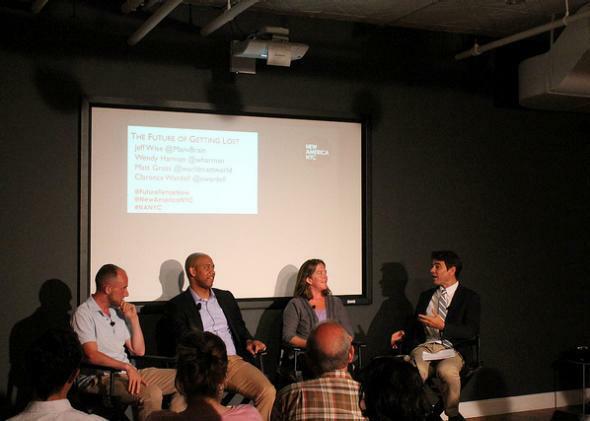 The Future of Getting Lost: a Future Tense event recap. Matt Gross, Clarence Wardell, Wendy Harman, and Jeff Wise at New America NYC. The received wisdom these days is that we’re always findable. With our smartphones in our pockets and near constant use of GPS, we think we can always discover where we are, and in cases of emergency, we assume the authorities can, too. That’s why, when Malaysia Airlines Flight 370 was lost, the tragedy was greeted not only with sadness for those aboard, but also confusion: We can “find my iPhone,” but we can’t find an enormous object carrying more than 200 people? It’s sobering to consider that even with an overabundance of sensors, cellphones, and radar, what’s lost cannot always be found. This was the topic of discussion at a Tuesday evening Future Tense event in New York on “The Future of Getting Lost.” Panelists Jeff Wise, a CNN aviation analyst and author of Extreme Fear: The Science of Your Mind in Danger; Wendy Harman, director of information management and situational awareness for disaster services at the American Red Cross; Matt Gross, editor of BonAppetit.com and author of The Turk Who Loved Apples: And Other Tales of Losing My Way Around the World; and Clarence Wardell, a research scientist at CNA Safety and Security, discussed the future of finding people in times of disaster, and how we can balance this important need with our deep-seated desires to at times lose ourselves—whether in our own cities or in regions as far flung as Tangier. To begin the conversation, Wise told the audience that a great deal has changed about the way we find lost people. It used to be that search-and-rescue operations were initiated when people failed to come home or show up to work, he said. Today, it’s far more common that the lost person themselves call 911 while hiking in circles in a canyon somewhere. Because of the perceived power of your smartphone, you’re more likely to wander off without proper preparation. So, he asked, are people less capable of being resilient during disasters because of an overreliance on such gadgets? At the Red Cross, Harman said, there are concerns about the trend of people being over-dependent on their smartphones. Wardell agreed: We’ve become less capable of picking up cues to save ourselves, he suggested. Many people can’t orient themselves without looking at Google Maps, and may not even be able to remember family members’ phone numbers. This is particularly dangerous, he pointed out, because as an April Washington Post article described, people are increasingly using their cellphones to call 911, but all too often, dispatchers are unable to find the person calling. In Washington, D.C., for example, almost 90 percent of 911 calls in a six month period of 2013 failed to offer the specific latitude-longitude location of callers. This is because faulty wireless technology often means authorities cannot determine which tower the caller’s cellphone is talking to or the signal’s quality is diminished due to poor reception. Not to mention, Harman added, you can rely on your cellphone only as long as it has battery. As people in New York discovered during Hurricane Sandy, an audience member commented, the ability to orient yourself sans phone is a vital one when the power has been out for days. These are serious concerns, but what about those moments we simply want to get lost. Will the age of the trackable smartphones render this an impossibility? Gross, when preparing to write his “How to Get Lost” series for the New York Times, decided that after years of paying attention to travel technology and guides, he would give it all up. So, just how lost did he get? Gross would go to cities such as Java, Indonesia, or Chongqing, China, with no hotel booked, no map, no contacts, and no plans. He discovered that getting lost is a moment to know what you’re capable of—how you react in situations that you’re unprepared for. In the end, an audience member suggested, this conversation is also about the future of serendipity. Matt Gross agreed—in fact, he said, the origin of the word serendipity is highly appropriate. According to some historians, the word was first seen in a letter by British writer Horace Walpole. Walpole wrote that serendipity was a word conjured from an old fairy tale, The Three Princes of Serendip. Appropriately for this discussion, the princes of the story “were always making discoveries, by accidents and sagacity, of things they were not in quest of.” In this spirit, getting lost may not always be something to avoid.